Have you ever looked forward to something so much that your expectations actually ruined the experience? I’ve done this to myself so many times. My expectations inflate like a birthday balloon, but when they’re not met I’m crushed. I guess that’s where the phrase “burst your bubble” came from. At the very beginning of my nomad journey I did this to myself yet again. Only this time, I actually started to make some progress toward breaking the cycle of expectation and disappointment. 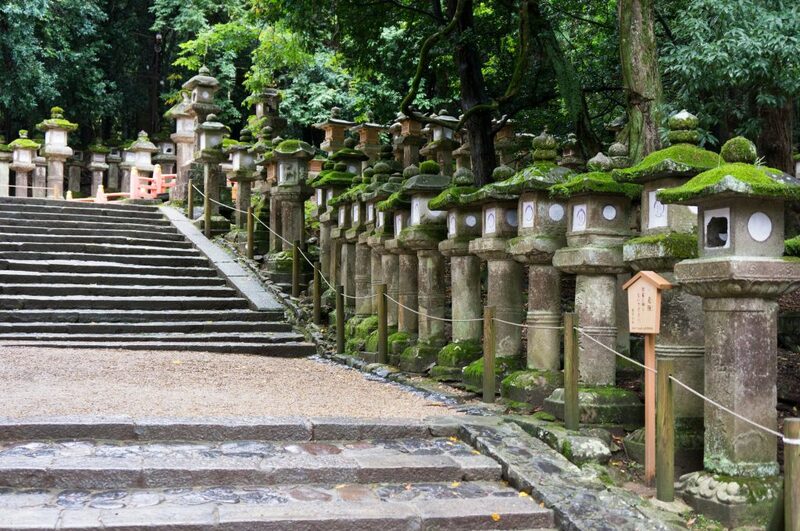 Tony and I have wanted to go to Japan together since we started dating in 2007. Ten years later in September, 2017 we finally made it happen. 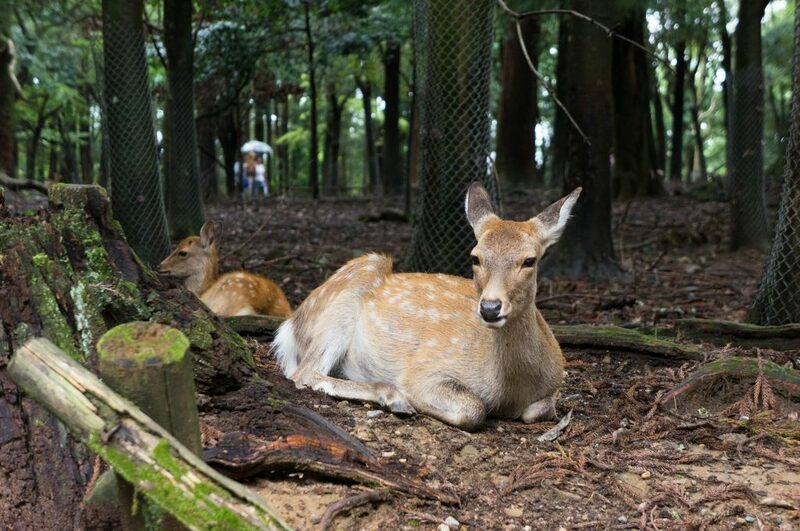 After possibly unhealthy amounts of YouTube research, I decided one of our adventures should be to the city of Nara where adorable little Japanese deer will walk up to you, bow, and then politely eat a “cookie” right out of your hand. I was sort of thinking about starting a travel blog. 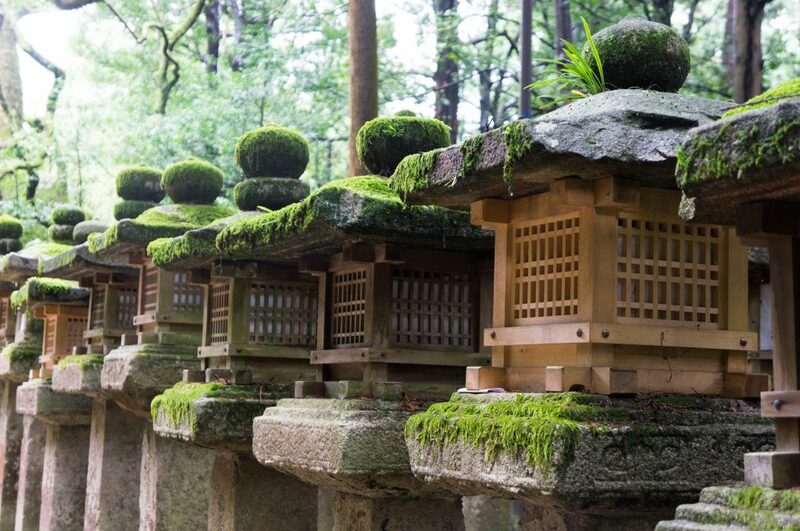 I thought I could start it off with amazing photos of Nara and tell the Pinterest Perfect story of how we experienced the most Japanese thing that ever happened. 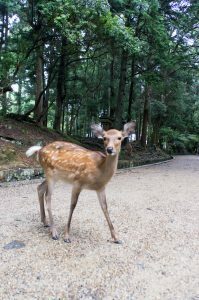 It was cold and raining the day we visited Nara park, but right on cue adorable deer wandered up to us. Down the path we found a man selling deer treats, and I bought a stack of cookies wrapped in paper for 150 Yen. This was it. My perfect Japanese moment was about to happen. But before I could even unwrap the paper, ten deer mobbed me. Instead of politely waiting their turn they pushed, shoved, and bit me. There were so many deer pushing and head butting me I almost fell over, so I tossed the pack of cookies to Tony. The mob transformed into a stampede as they rushed toward Tony and the cookies. The cookies were wrapped so securely Anonymous couldn’t get in, and as he struggled with the paper a little deer bit Tony in the crotch. We played another round or two of keep away before the paper wrapper burst open and the whole stack of cookies came crashing to the ground. 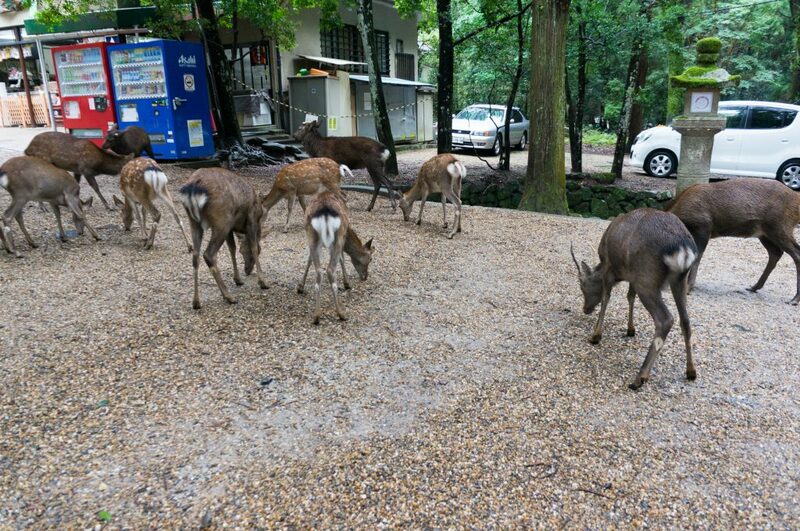 The deer unceremoniously vacuumed up the shattered cookies then wandered off to mug some other starry eyed tourists. The Disney moment I had looked forward to for months was over before it even started. Tony was amused, crotch bite and all, but I felt like I had been punched in the gut. Everything that had gone wrong looped in my head. The deer weren’t polite, they were aggressive wild animals. I wanted to look cute in photos so I didn’t wear my rain jacket, but that left me cold and wet. Despite this, I couldn’t even get a good selfie. Tony graciously volunteered to take pictures of me, but I felt like I was grimacing in every one. I wasn’t grimacing in a photo, I was actually just unphotogenic. It wasn’t just a bad moment, it was a bad day, or worse. Maybe Japan wasn’t as great as I thought. The rest of the trip would probably be gimmicky and disappointing too. I felt wounded. I spent months building my expectations only to be betrayed by them. Cold, tired, and let down, I retreated to the closest restroom and cried. When I came out, a little calmer but still deeply disappointed, Tony said something about this making a great story. 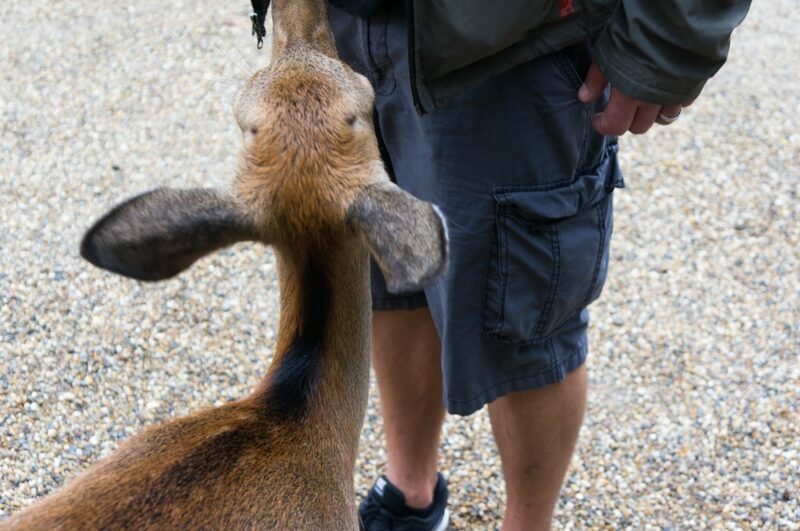 It’s certainly memorable – a man doesn’t forget flying half way around the world to be bitten in the crotch by deer. Unlike me, his only expectation for the day was having a nice walk in the park with his wife. Adding to our collection of crazy Kat and Tony adventure stories was a bonus. I was – and still am – so grateful for his perspective. The experience wasn’t what I expected, but it was uniquely ours. 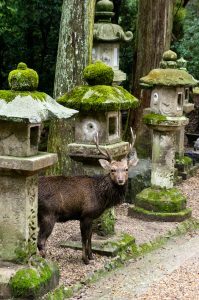 In a sea of perfect Nara stories, we would have our story about being mugged by tiny deer. I expected wild animals to behave as though they were trained pets. I expected to look amazing in photos when I’m almost always behind the camera, not in front. I expected Tony to take my camera and execute my vision even though he’s maybe used my camera once before and I didn’t even tell him what I wanted. I had two fundamental problems: I was placing too much importance on my expectations, and a lot of my expectations were unreasonable to begin with. Tony helped me address the first problem – placing too much importance on expectations – when he shared his perspective with me. Sometimes I need to take a step back, evaluate the situation, and say to myself if something doesn’t matter, don’t let it matter. I can fantasize all day about how dinner will taste, how Tony will praise my skills, and how easy I’ll make it all look. But if it’s just Tuesday night dinner for Tony and me, it doesn’t really matter. I can still make a genuine effort. I can still enjoy the process of cooking. I can still want the meal to be delicious. But I shouldn’t let my sense of self worth hang on whether or not I overcooked the green beans. Easier said than done, right? That’s why I’m making this a new mantra so I can keep my tendency to over-inflate my expectations in check. If something doesn’t matter, don’t let it matter… If something doesn’t matter, don’t let it matter. Pssst… did you know you can highlight text (like my new mantra) to tweet it? 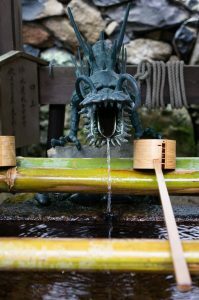 Thinking about addressing the problems I had in Nara led me to a realization: a lot of the time I have more control than I realize. I have the power to make a lot of my expectations more likely to come true. Some of my crazy expectations would be more reasonable and more likely to turn out well if I had done a little leg work. Even when I can’t influence the likelihood that my expectations are met, I can often adjust the importance I place on those expectation. If I want to be in photos, I can learn how to be a subject. I can practice, read advice, or take classes. And until I’m taking good photos consistently, I shouldn’t let anything hinge on having amazing pictures of myself. I can exercise control by setting myself up for success, and weighting my expectations accordingly. I’ve finally got this narrowed down to three simple steps. They make it a little easier to assess my expectations and avoid an inflated sense of disappointment when things don’t turn out the way I wanted. 1. Does this actually matter? When the answer is “no”, I try not to let it matter. That means not investing emotionally in the outcome, and not letting anything hinge on the outcome. If the answer is “yes” I move on to step two. 2. What control do I have? What, if anything, can I do to make success more likely? Can I take classes to prepare myself or bolster my skills? Should I plan to spend more time so I’m less rushed? Would it make sense to ask for help, or maybe even hire a professional to do it for me? 3. Can I adjust how important this is? Is there a way to make this outcome not matter at all? If so, go back to step one. If it still matters, how much does it have to matter? Can I create a backup plan to reduce the importance of any given outcome? Can I make the outcome a bonus rather than an essential? Can I change the plan so that even a lower quality result works? The only tricky part now is just remembering to take these steps, because it’s a whole lot easier to nip this stuff in the bud than it is to talk myself down when I’m already upset. Plus, if I remember these three steps early enough, I have a chance to do more planning and exercise more control. This is where my new mantra comes in handy… if something doesn’t matter don’t let it matter. Having that phrase at the tip of my tongue reminds me to re-evaluate my expectations and follow those three steps. Have you ever set your expectations too high, or expected unreasonable things? Do you think my three step process would help, or do you have another strategy? Tell me about it, because sharing means caring!